Butler Fieldhouse is a prime example of an early 20th century sports arena, one of only a small number of its kind left in the nation. 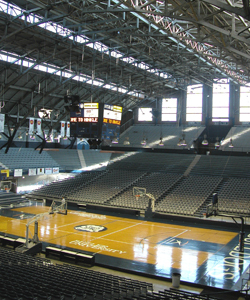 Through the years, championship games and special events have enhanced the fieldhouse’s reputation as a historic venue. Few places in Indiana embody the state’s passion for basketball more than Butler Fieldhouse. The interior of the fieldhouse figures prominently in the classic movie Hoosiers, where the actual title game depicted in the movie was held. Basketball is a Hoosier obsession that spans over ninety years. Colleges gathered players from the highly competitive Indiana high school scene. In 1911, the Indiana High School Athletic Association sponsored the first statewide championship tournament. Any school could compete and win the championship. Butler University coach Tony Hinkle had been building the Butler Bulldogs into a nationally respected team for years when the school constructed Butler Fieldhouse on its new campus in 1928. The fieldhouse brought statewide and national attention to Butler University and to Indiana basketball and became the home of the state championship game until the 1990s. In 1928, at this building, Hinkle’s Bulldogs won their inaugural game against top-ranked Notre Dame. They went on to take the national championship. Hinkle coached at Butler for fifty years and won over 1,000 games during his career. The fieldhouse remains one of the best-preserved early basketball venues in the United States. Basketball required little more than a proper ball and an apple basket at first. When the game was forced indoors by the weather, a building resembling a wooden barn would suffice. As educators accepted the odd game into their physical education courses, something more permanent and fireproof was needed. Iron and steel provided the clear spans that architects needed, while brick walls provided fireproofing. The architecture of the Butler Fieldhouse reflects these innovations in technology and design, which would shape gym design for decades to come. Its seating capacity of over 15,000 was unprecedented. Fermor Spencer Cannon, the architect of the fieldhouse, was a successful Indianapolis architect in the early 20th century and a founding member of the Indiana Society of Architects. Butler Fieldhouse (Hinkle Fieldhouse), a National Historic Landmark, is located on the north side of town, at 49th and Boulevard Place. Click here for the National Historic Landmark registration file. The facility is generally open business hours and for special events. Recommended: Take in a Butler Bulldogs game in this classic basketball palace. Consult Butler University for information on game dates and times. INDYGO bus line from downtown: #28 St. Vincent’s (outbound), disembark at Illinois and 49th Street, walk west on 49th to Boulevard Place.